Cold brew coffee that has more caffeine than traditional hot coffee without any of the bitter taste? Yes, please! In a large container, stir 1 1/2 cups coarse-ground coffee and 8 cups water until combined. If you would like to make more, this recipe can be doubled or even tripled. Cover and refrigerate for at least 12 hours or up to 24 hours for more flavorful coffee. Line a small, fine-mesh strainer with a coffee filter or cheesecloth and place over a large container. Slowly pour the coffee concentrate through the strainer; discard filter and grounds. Cover and refrigerate coffee concentrate up to two weeks. 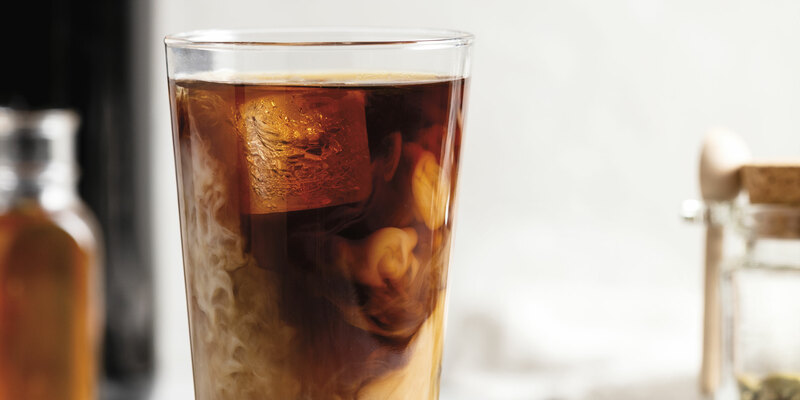 To serve, fill a glass with ice cubes; stir in 1 part coffee concentrate and 1 part cold water (for a stronger brew, skip the water). Enjoy coffee black or try a flavor combination from below! Make your perfect cup of coffee by adding as much (or as little) as you'd like. Prefer a hot drink to start your morning? Simply heat your beverage in the microwave or on the stovetop.